We manufacture wide range of Threaded Components. Available in various customized specifications such as size and grade, we offer our range at most affordable prices. Our organization has successfully expanded its business in market owing to the offered elevated quality array of Threaded Component. Our offered products are highly demanded in engineering related industries to use in machinery. These components are manufactured by our skilled personnel using the premium quality raw material and progressive technology at our sophisticated manufacturing unit. 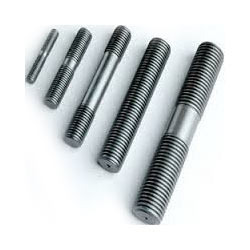 We are engaged in offering a wide array of Threaded Stud to our esteemed clients. These products are manufactured using high-grade metals and latest technology. We make available these products to our clients in a number of dimensions, sizes and shapes. Our offered array is exclusively manufactured in compliance with international quality standards ensuring our customers satisfaction.